In a Tweet this morning, Peter Molyneux asked for comments regarding Fable 3's current lack of combat in the first 30 minutes of play. While one might say that this is merely lip service, and that the feedback had nothing to do with the decision, I'd argue that reading everyone's comments had to have some kind of an impact. Does this mean that we will see more direct solicitation for feedback from game designers on Twitter? After bro-hugging Molyneux at GDC last week, I didn't think we'd get much more communication out of him regarding Fable 3 in the next couple of weeks. Apparently though, after playing through the opening sequence of the game, he became worried about the lack of combat early on. Molyneux asked for comments and then clarified in a later Tweet that the sequence was without fighting because of there was so much "drama." "Been playing the opening of Fable 3, I am slightly worried that there is no combat for the first 30 mins. Is this too long, thoughts." Molyneux's first Tweet read. A few hours later, Molyneux clarified his statement in another Tweet. In responce to the 1st 30 min no combat. There is no combat because it is so dramatic, and that drama has little room full combat. 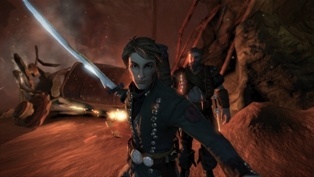 Many will point to the opening of Half-Life as a similar sequence in which mood and characterization took precedence over combat. And if you're erring on the side of Half-Life, I don't think there's anything wrong with that. It is awesome that Molyneux is able to ask direct questions like this of his audience so long before the game is released, and to even get decent feedback. Doing a quick search of @pmolyneux reveals comments that run the gamut from "That may be a little too long." to "i'll take story progression over combat any day."